In a unique setting just off the Ring of Kerry in Ireland, just 25 yards from their own secluded shingle beach sit a pair of old stone coastguard cottages.Overlooking its own shingle beach with panoramic views over the beautiful Kenmare estuary, it can sleep up to 7 people and is ideal for all types of activities from hill walking to cycling or writing, or simply sitting outside and watching the seals playing on the rocks. Whether you want to boat and fish or just relax and enjoy the peace and serenity of these beautiful surroundings, Pier Cottage is the ideal sanctuary. 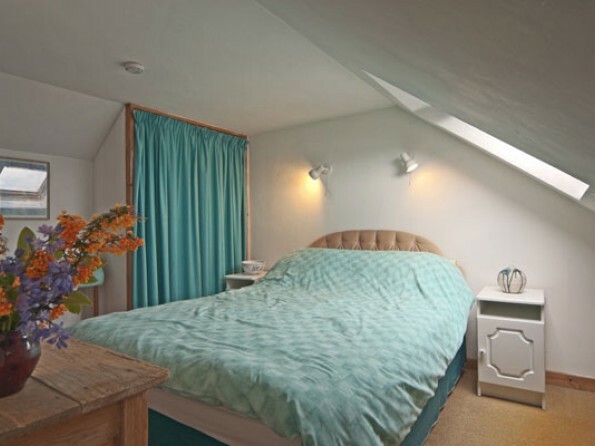 The cottage can be rented through the year either as one piece or as two separate units - West End and East End. Altogether this flexible accommodation sleeps up to 11 people (2-4 in one and 7 in the other) and this is a wonderfully remote place for everyone both young and old to escape to. Lovers of the great outdoors will be in heaven – opportunities for walking and fishing are abundant and keen golfers will find no fewer than 5 excellent and varied golf courses within an hour of the cottage. Visit the ruins on Abbey Island, relive history at Staigue Fort, or stop for a Guinness in one of the local pubs. 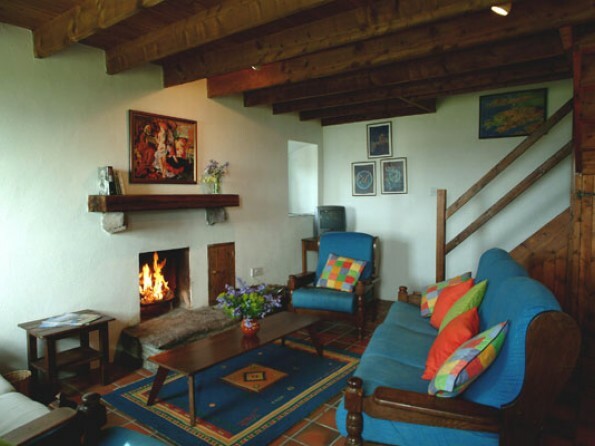 From Pier Cottage you can explore and enjoy Ireland at its very best. 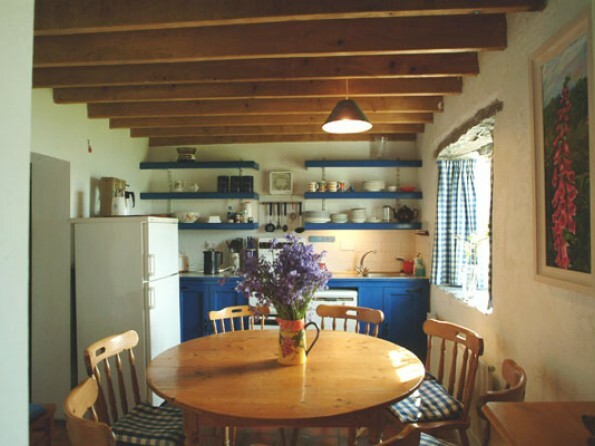 The cottage is in Westcove, 1 mile west of Castlecove, 3 miles east of Caherdaniel, just off the famous 'Ring of Kerry', one of the most scenic drives in Ireland, and one hour south of Killarney. 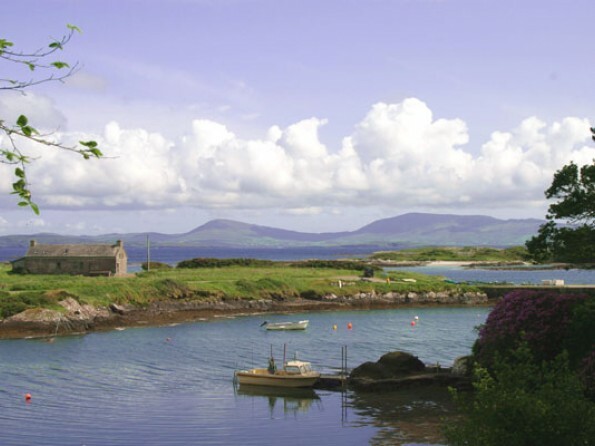 There are lovely beaches, pubs and historic sites within 15 minutes’ drive and there are numerous possible excursions: head north to Killarney with its magnificent lakes, northwest to the legendary Dingle Peninsular, or west to Waterville, Balliskellings and Valencia Island, from where you can take an unforgettable boat trip to the Skelligs. To the south lies Bantry Bay, accessible via spectacular mountain passes. 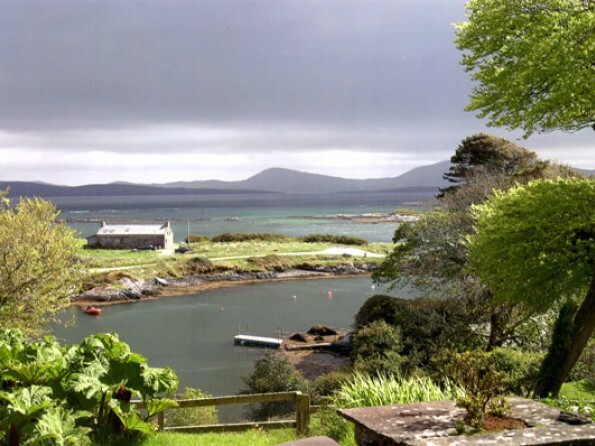 Kerry and West Cork are dotted with tropical gardens, especially beautiful in May and June, and the countryside surrounding Castlecove is ideal for all types of walking, from gentle strolls along beaches to serious hikes over craggy hills. The 'Kerry Way' walk takes you along the ridge of hills, all the way from Waterville to Kenmare and is well sign posted, but still unspoiled. There is no public transport in Westcove so a car is essential for getting around. 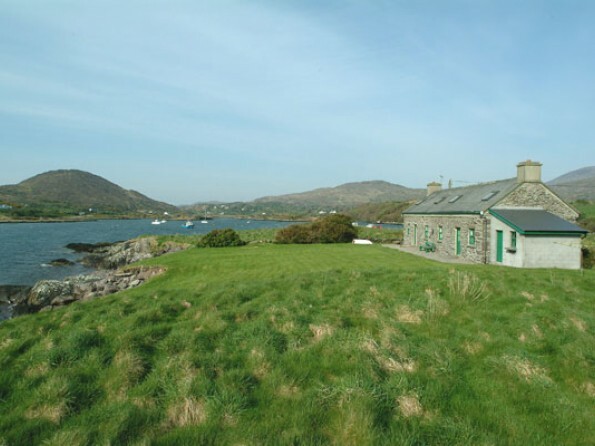 The property is located in Kerry, on the southernmost point of the scenic 'Ring of Kerry', overlooking the beautiful Kermare Estuary - between the villages of Castlecove and Caherdaniel, ten miles west of Sneem and ten miles east of Waterville. 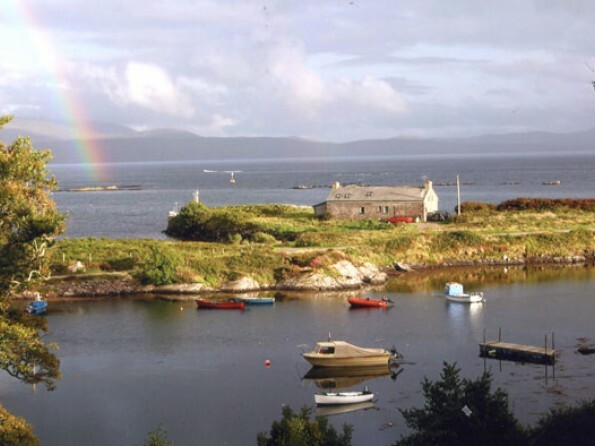 The nearest airport is Kerry, 20 minutes north of Killarney and 1½ hours drive from Westcove. Ryanair fly there from Luton and daily from Stansted. Many airlines fly to Cork, about 2¼ hours away: from London (Heathrow and Gatwick), other UK airports and Europe. Shannon Airport is a good 3¼ hours drive away. West End, which sleeps 7, has 3 bedrooms – one twin, one double and one with 3 singles. The sitting room has an open turf fire and a storage heater to keep you warm on those cold Irish nights, as well as comfortable seating and a TV and DVD player. The open plan kitchen is equipped with an electric cooker, fridge/freezer and dishwasher, and it has a round dining table which seats up to 8. There is a family bathroom with shower upstairs as well as an ensuite shower room (ensuite to bedroom 2), and a loo downstairs. East End has 2 bedrooms sleeping 4 – one king and one with two singles. The bathroom is upstairs, and downstairs are a living room and a kitchen corner. 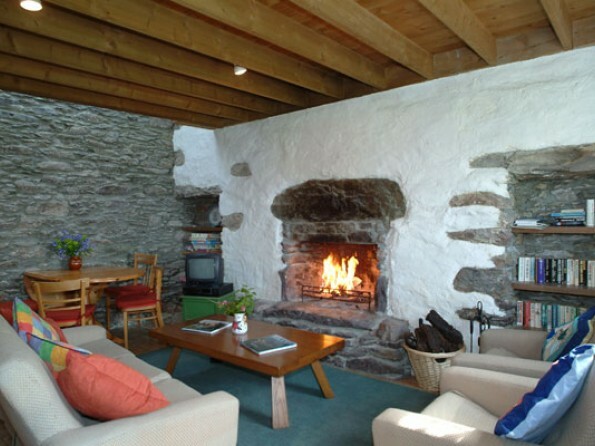 The living room is a spacious open plan area with a turf fire, a storage heater and a dining table for 6. It also has a TV and DVD player. The kitchen has the same mod cons as the other cottage. 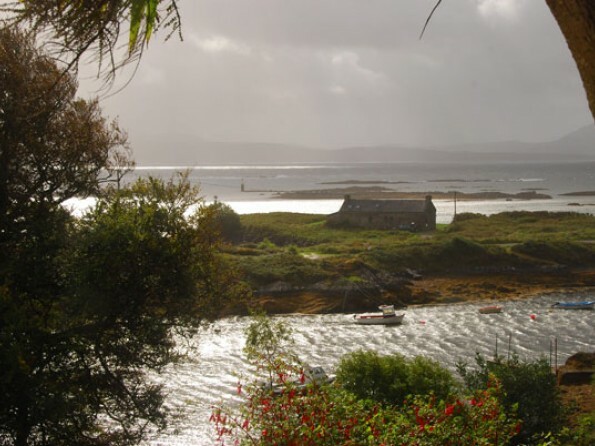 Outside the cottage is nothing but wonderful views over the Kenmare estuary. Just 20 metres away from the cosy indoors is a private shingle beach where you can fish, skim stones and watch for seals bobbing in the water. This is an ideal holiday venue for those wanting to bring a boat, as there is always safe mooring available in the little harbour and a slipway for launching beside the pier. Apart from excellent mackerel and other deep sea angling, there is good rock fishing in the immediate locality. There are several golf courses in the area including 2 just 10 miles away at Waterville. Salmon, trout and sea fishing can be arranged locally. Some of our visitors enjoy spinning for bass, mullet etc. from nearby beaches and rocks. If you’re interested in other water sports, you can swim, row and shrimp nearby and there are several sandy beaches within ten minutes’ drive. 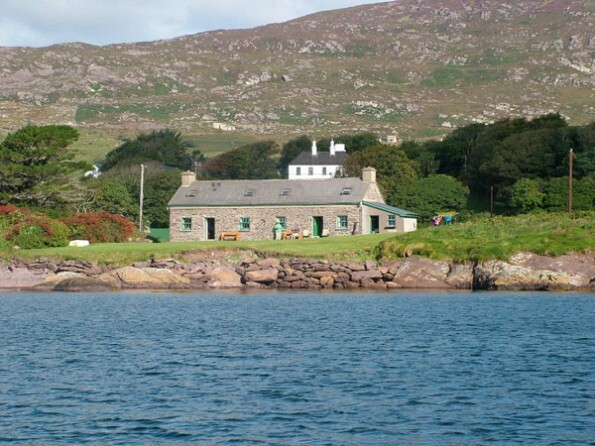 Derrynane, 4 miles away, has an excellent water sports centre in the summer with facilities for all ages, including water-skiing, windsurfing, sailing and canoeing. Scuba diving facilities are also available locally. If you like to shoot, then during the winter, challenging shooting over the wild stretches of bog land for woodcock and snipe can be arranged. Likewise for horse lovers, beach riding and pony trekking are available 2 miles away at Caherdaniel. And when you want to relax with a pint and some grub, there are several excellent and varied restaurants around. The convivial atmosphere of the Irish pub is legendary and the whole family can be assured of a warm welcome! Changeover day is normally Saturday but in low season this can be flexible. 7 night minimum stay from mid June - mid September. Short breaks are sometimes available at other times of year. For both cottages a cot and high chair are available. 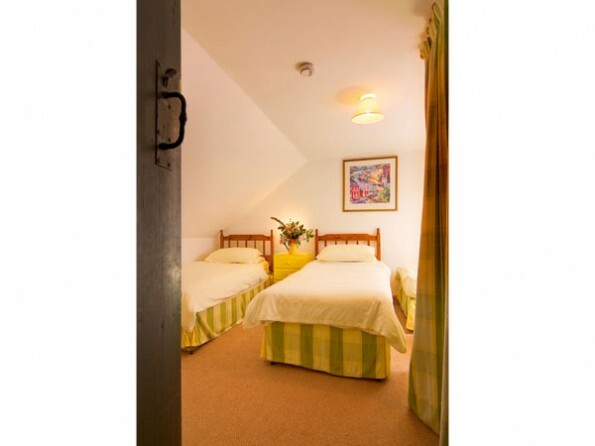 Bed linen (duvets) and towels are provided and electricity is included in the rental. 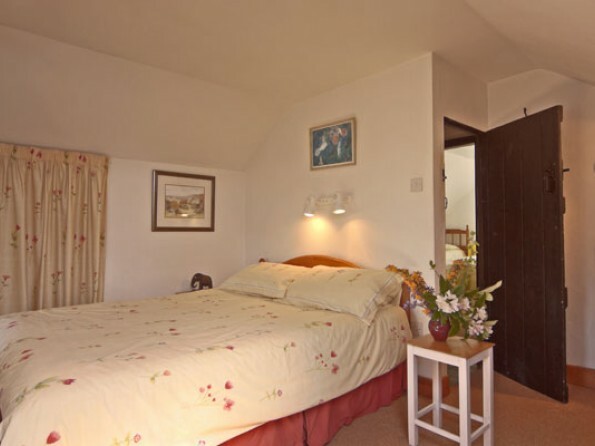 All rooms, except the utility room, face south over the estuary and are equipped with electric wall heaters. Domestic help and babysitting are available by arrangement and there is a rowing boat for tenants to use at their own risk: life jackets are provided (please consult safety leaflet in cottage before taking boat out). Bicycles, fishing rods etc. may be stored in a lean-to shed, adjacent to East End. Dogs are welcome, but not upstairs or on the sofas and chairs please! Also be very careful and keep them on leads at all times when walking in the hills when there are sheep around. WiFi access is included in the rental.